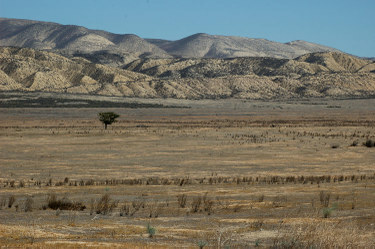 The Carrizo Plain National Monument is remote: 40 miles past the sign in Santa Margarita that says "Next Services 82 Miles." Visitors should make sure to bring plenty of gasoline, all the water they will need, and a good map. As well as a very empty landscape, summer visitors will see a handful of other humans, and possibly excellent wildife: we saw many otherwise-exotic birds, a badger, and pronghorn antelope. 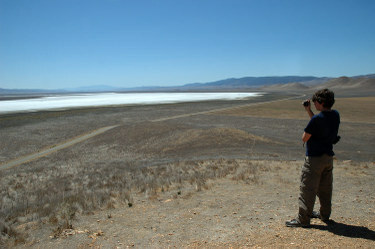 Soda Lake at the Carrizo Plain National Monument is very -- empty. There seems to be plenty of nothing there. During the winter, the lake contains water, and hundreds of thousands of migratory birds pass through. Before the advent of irrigated agriculture, many places in the Central Valley provided similar stopovers; now such places are rare. 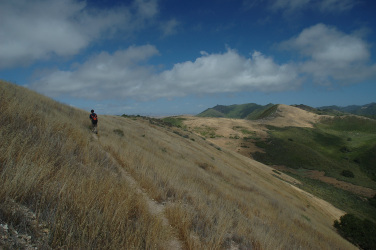 Oats Peak at Montana De Oro State Park provides a great view inland. It's a long climb up from sea level, though, and a long hike down; and often, the weather is foggy and the view is obscured. 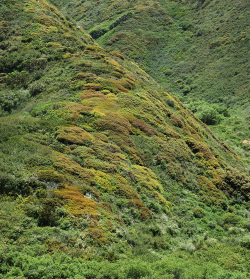 This particular hillside at Montana De Oro State Park seems particularly beautiful every time I hike past it. The different shapes, and shades of green, are part of the charm. 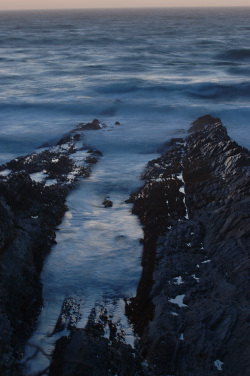 Surf in a narrow inlet at Montana De Oro State Park. Skies were clear and the waves were not too large on this pleasant summer day. Sea otters were playing in the waves just outside the surf zone. 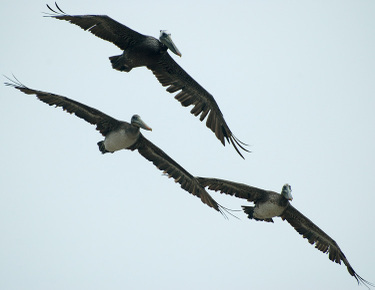 Three Brown Pelicans cruise along the beach. 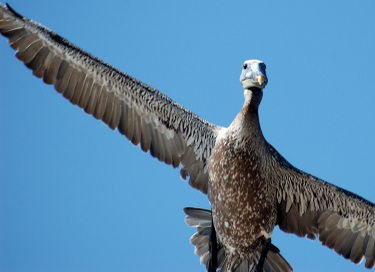 These birds are very particular about their nesting sites, and no longer nest on the mainland. But, they seem to enjoy traveling across the channel for a meal or maybe just for an outing, with friends. 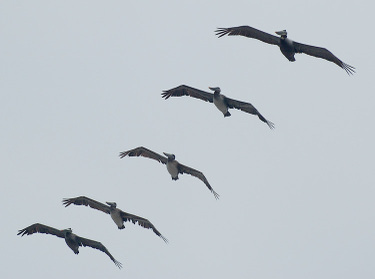 Pelicans like to fly in formation, usually either in a "V" or in a line diagonal to their direction. The formation probably does reduce the effort they require to keep aloft, by suppressing the vortices trailing from their wingtips. 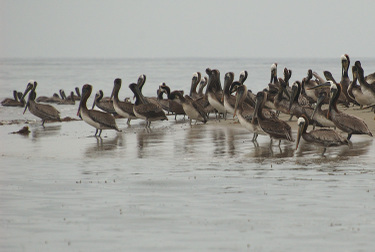 It might also help them to watch out for pelicans in front, and to scan a wide swath of ocean for fish.